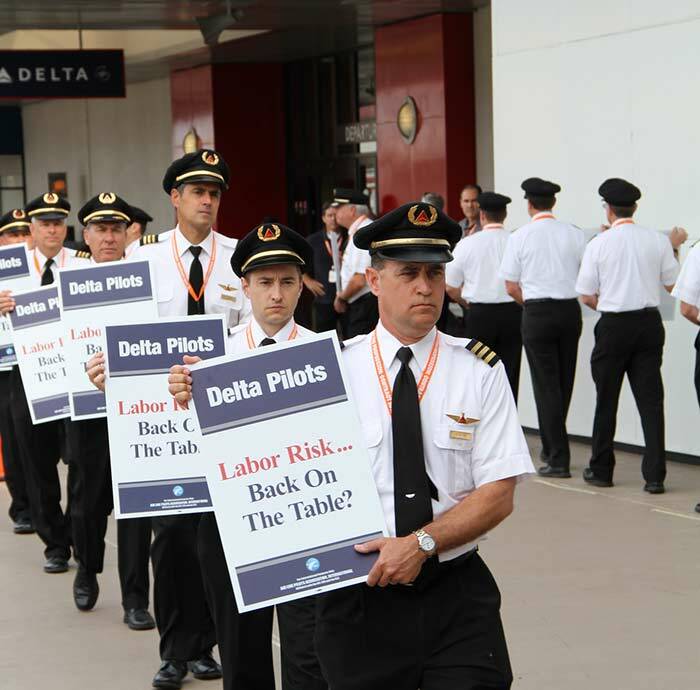 ATLANTA, GA–Delta Air Line pilots, represented by the Air Line Pilots Association, Int’l (ALPA), conducted informational picketing at Delta hubs across the United States on Friday, June 24, to raise the sense of urgency in concluding ongoing negotiations. It is past time for Delta management and the Board of Directors to recognize the rising market for pilots and bring these negotiations to a timely conclusion. The goal of the union is to achieve negotiated contractual changes that recognize pilot sacrifices and contributions to Delta’s unprecedented success. Union leadership sees no obstacles to achieving this goal by this summer. Over five months have passed since the contract's amendable date; fifteen months since negotiations began and the Delta pilots are still awaiting a new agreement. ALPA and Delta jointly filed for mediation with the National Mediation Board on March 31, 2016. All other employees, shareholders and investors have benefited from Delta's success. Now it is the Delta pilots' time. Delta Air Lines is highly profitable and remarkably successful. The environment is opportune for the Company to significantly improve pilot compensation and work rules slashed during bankruptcy. For the first quarter of 2016, Delta recorded a historic pre-tax income of $1.56 billion—nearly triple from the first quarter of 2015, the previous historic high for Delta. Delta’s recently released 8-K filing confirms it is time to reward the pilots for their commitment to the Company’s success. Delta has earned the "investment grade" designation; it is time that Delta recognized its pilots are "investment grade" and compensate them appropriately. “All other stakeholders – management, the other employees, investors – have now been rewarded . . . except for the pilots. It is time for the Delta Board of Directors to acknowledge our investments in the corporation, address the rising market for pilots, ensure Delta will continue to be able to attract the best of the best and take the necessary steps to recognize the Delta pilots as equal business partners as we move forward together to write the next chapter in Delta’s story,” stated Captain John Malone, MEC chairman, in a recent Chairman’s Letter. See more photos: Delta Pilots Informational Picketing Across U.S. Founded in 1931, ALPA is the largest airline pilot union in the world and represents over 53,000 pilots at 31 U.S. and Canadian airlines. Visit the ALPA website at www.alpa.org and the Delta MEC website at https://dal.alpa.org.